Mimi Anderson, 55, began running in Los Angeles on Sept. 7. If all goes well, she will finish her cross-country run in New York City at the end of October. Think of all the people at home who think that you're going to fail. In the middle of the Marathon des Sables in the Sahara Desert, a steady IV drip pressed into Mimi Anderson's arm and a dark, barren expanse lying ahead, this was the thought that got her through. It was enough to lift the Edinburgh, Scotland, native from her darkest moment as a novice ultrarunner and motivate her to finish the last half of the 150-mile, six-day race. It was the longest and toughest day, and the extended exposure to elements and mileage is known to break the most weathered competitor. And up until that point, Anderson had never run anything longer than a half-marathon. When she sat despondent in the dark in a tent, staring out at the torches that lit up the desolate path back to the finish for the day, a teammate brought her back to this sentiment: Imagine how many people don't expect you to finish this. That line has stayed with Anderson ever since, through 16 years and races that have crossed the Arctic Circle and Ireland, through 32 days across South Africa and through a nonstop race from Athens to Sparta in Greece. And it will carry her through her longest challenge yet: a solo attempt to break the standing world record of fastest woman to cross the United States on foot. The 55-year-old grandmother began running "out of total vanity" almost two decades ago, and somehow she got hooked on seeking out -- then crushing -- the most grueling long-distance challenges possible. Anderson set off from Los Angeles City Hall on Sept. 7, and if she sticks to the meticulous course and schedule she devised nearly three years ago, she should make her way into New York City by the end of October, 53 days later. The standing Guinness World Record of 69 days, two hours and 40 minutes was set by Mavis Hutchinson in 1979. Anderson often uses visualization to motivate herself in the toughest moments of a run. She will push herself through the last strides of a 2,850-mile feat with the image of the George Washington Bridge. When she sees the Manhattan skyline within reach after nearly two months traversing the country, Anderson will know she's close to the end. 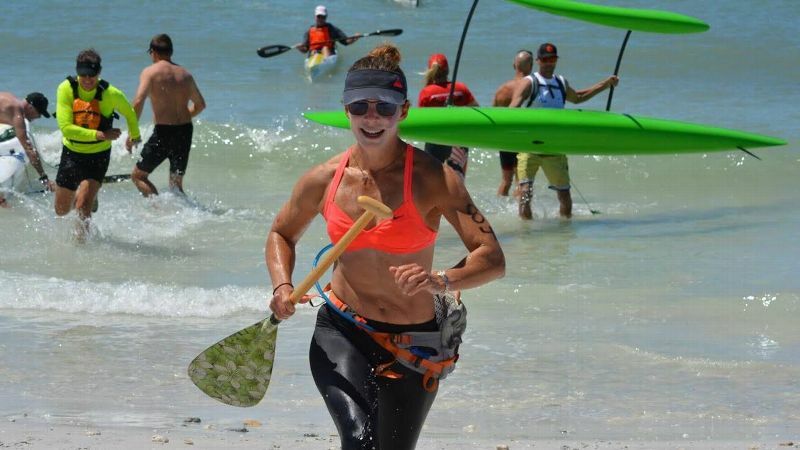 "The human body is an amazing machine," Anderson said, before she set out on the run. "So for me, it's, What is it capable of achieving? What can I do for myself? Can my body run across America? Is my mind strong enough to take me? 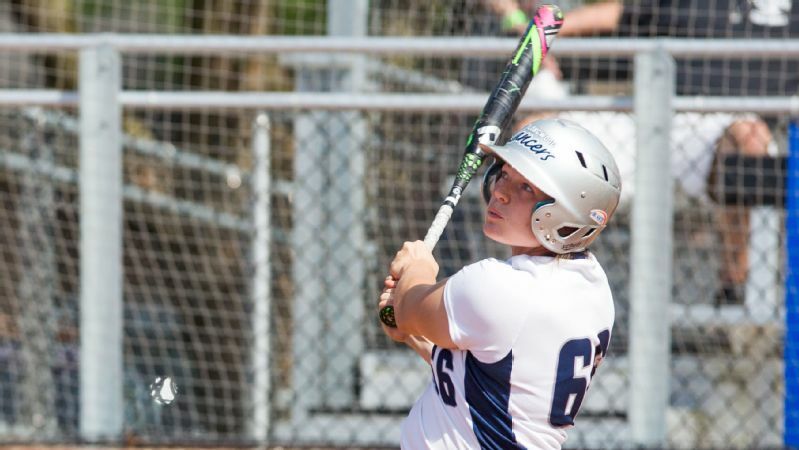 "It's not just about the body, it's being able to do it again, every day, mentally -- to be strong enough to get up, when you're absolutely on your knees, but you have to get up and get running." Anderson's cross-country endeavor began in jest when she teased her husband about never having seen New York. "If you don't take me, I guess I'll just run there," she wagered then. She began truly considering the attempt in 2013 and scheduled her run for 2016, only to delay a year after a meniscus tear last May. Her training has been fastidious, Anderson said, and her rehabilitation textbook. One bit of me is very excited. ... Another part of me is absolutely terrified. Anderson first started considering the run in 2011. That same year, across the Atlantic in northern California, Sandra Villines had just started running to get in shape and be a role model for her daughter. "It spiraled from there," she said. Villines -- who goes by Sandra Vi -- is running to break the record simultaneously. She was initially supposed to leave on Sept. 9 from San Francisco City Hall, then regrouped with a new team and financial support to depart on Sept. 11. "To me, it's like a little bit further every time," Villines said, three days into her journey. "'OK, I can do a marathon,' then, 'OK, I can do a 50K.' It was on my bucket list to do Badwater [a 135-mile ultramarathon], so I picked it up a little bit, and started thinking about a 100-miler." 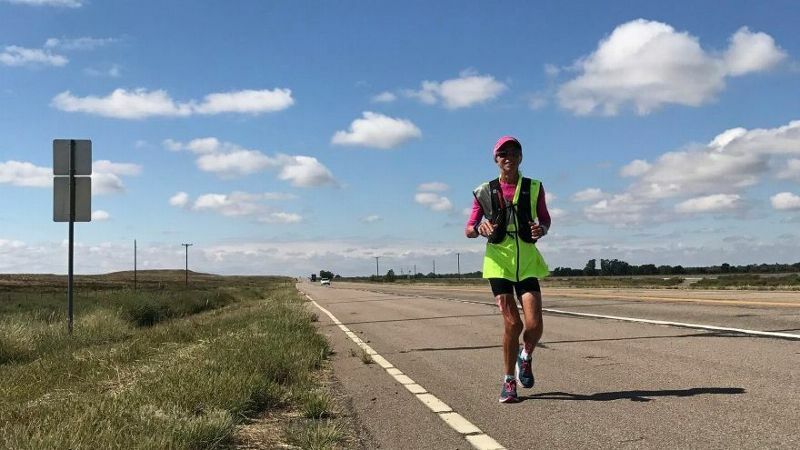 Villines, 44, closely followed Pete Kostelnick's record-setting 2016 run across the U.S. (he finished in 42 days, six hours and 30 minutes) and thought, "All right, I can do that." She checked off a bunch of 50K races before a victory in Death Valley in the Badwater 135 in July. If Anderson had run last year as intended, Villines might be chasing down Anderson's record this month. Instead, out of pure coincidence, two different esteemed ultrarunners are attempting to break the world record at the same time. Both women know the other is running; and both are adamant that they will focus on their attempt, and their attempt alone. If Villines' race goes as planned, she could potentially arrive after Anderson by a few days and break a newly set record. But that's assuming that both runners maintain their health and pace across thousands of miles. "One bit of me is very excited," Anderson said in the week before she left. "It's been a long, long journey. Another part of me is absolutely terrified. It's a long way. No matter what training you do, you never know what will happen." 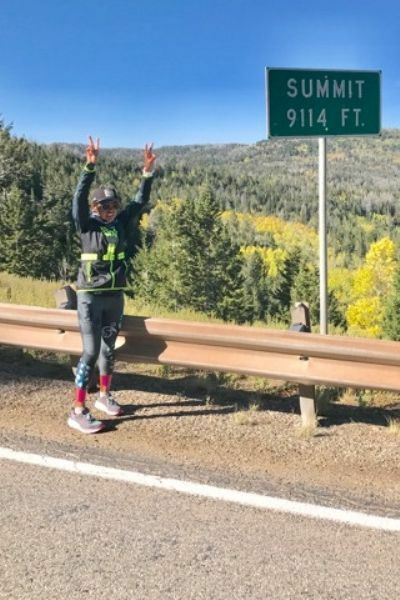 Sandra Villines, 44, left San Francisco on Sept. 11 and will end up in New York City -- and she hopes to break Mimi Anderson's record if Anderson completes her run. Villines' route winds north and tracks Kostelnick's crossing, ending in New York City like Anderson's route. It's also longer than Anderson's in mileage (3,067 miles), but likely cooler in temperature. Anderson's first route was based solely off Google Maps, but crowdsourcing from running communities across the country helped her cross off impassable routes. Anderson and Villines are traveling with teams to manage transportation, sports medicine and coaching, and will stay in RVs each night. Both are also running to raise awareness for nonprofit organizations (Free To Run and Marie Curie for Anderson, and Girls on the Run for Villines). Both runners are up by 4:30 a.m. and out the door by 5 a.m. Each morning, Anderson takes a breakfast of coffee and porridge with a banana or a breakfast smoothie while the team conducts various physiological checks as she gets dressed. As of Sept. 28, she had just crossed into Kansas. Villines was almost through Utah, headed for the Colorado border. On her third day out, Villines pushed into Yosemite up a steep climb that "made Mount Whitney look like a cakewalk," she said. Two different cars stopped on their way up the hill to offer Villines a ride. "When the RV is in sight, it's like a finish line every day," Villines said. "I just work toward getting through to the end. Every day it's like this -- get up, start fresh and get to the end, so I can do it all over again the next day." The Guinness World Records ruling doesn't specify that the record must be set along a certain route or mileage. It's a coast-to-coast completion, however one chooses to get it done. By the end of October, a nearly 40-year-old record could be broken twice, once or not at all.